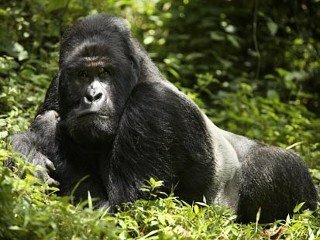 Bitukura family is located in Ruhija side of Bwindi Impenetrable National Park. There is accommodation in Ruhija but most tour operators prefer taking their clients to Buhoma for accommodation as Buhoma has several options when it comes to Lodging compared to Ruhija where this Family is located. If you stay at Buhoma, you will need to wakeup early as there is need to drive at least two hours to reach the starting point. The Bitukura family is peaceable, with little in way of the politics and monkeyshines prone to gorilla families. Ndahura sees to that. The Bitukura and Kyaguriro families share a close bond and are known to have, what can be described in human terms as get-togethers about once each month. The biggest mystery surrounding this peaceable family is the migration of its eldest juvenile daughter to the Kyaguriro family. Whereas it is known that on reaching adulthood, female gorillas are prone to leave the family in favour of starting a family with an eligible solitary male, or simply joining another family – like Twigukye did – she was nonetheless rather young to make the move. But she did it and a study of the family members may help give a clue to this unusual occurrence. Friend them and find out.